requirements, largely set to aid the downstream passage of juvenile salmonids. Nearly 9,000 spring chinook salmon were held up between Lower Monumental Dam and Little Goose Dam on the lower Snake River and last week the interagency Technical Management Team changed operations by reducing spill at the dam that it had hoped would get the fish to pass at Little Goose. Spill at the dam this year has typically topped more than 50 percent of the river's flow and at Little Goose that high spill and flow is causing a downstream eddy that dam operating agencies believe is discouraging spring chinook from passing. High river flows and resulting spill at Snake and Columbia river dams have been considered "unmanageable" by fisheries managers of the Technical Management Team, but this week they and federal dam operating agencies may have found some knobs to turn to manage some aspects of this year's high flows. Beginning Saturday, June 3, the U.S. Army Corps of Engineers began an operation that would reduce spill at the dam to 40 percent of flow for six hours, 4 am to 10 am. They continued the operation until Monday, June 5, with no results as far as fish passage is concerned. Saturday passage at Little Goose was 793 spring chinook, slightly up from Friday's passage of 762, but passage dropped to 578 Sunday and only 390 chinook passed the dam Monday. "The only ones who didn't get the message (about the reduced spill) were the fish," Russ Kiefer, Idaho Department of Fish and Game, said at Monday's TMT meeting. "It's apparent we did not affect passage as we had hoped." So, TMT changed the spill proportion to 30 percent, and this time they seemed to have hit a sweet spot for fish passage. The number of fish passing the dam on Tuesday rose to 1,542 and at Wednesday's TMT meeting managers agreed to leave the 30 percent spill proportion in place for one more week, but to add two hours, extending the period of 30 percent spill to a full eight hours each day. Some 15,101 adults and 5,439 jacks had passed Little Goose Dam – the upstream of the two dams -- as of June 5, but 23,665 adults and 6,618 had passed Lower Monumental Dam, leaving almost 9,000 fish lost in the Little Goose pool. As has been typical of the spring chinook run this year, some 56,581 adults and 5,567 jacks had passed last year at Little Goose by June 5, and the 10-year average is 56,615 adults and 9,835 jacks. Lower Monumental numbers are 61,388 adults and 5,614 jacks had passed last year by June 5, and the 10-year average is 62,271 adults and 9,376 jacks. The operations – both the 40 percent and the 30 percent operation – violate the minimum operating pool requirements, largely set to aid the downstream passage of juvenile salmonids. MOP calls for a one-foot range in each of the lower Snake River reservoirs from April 3 to about September 1 while juvenile migrants are present (see the 2017 draft Water Management Plan). The range for MOP is 633 to 634 foot elevation in Little Goose Dam's forebay. 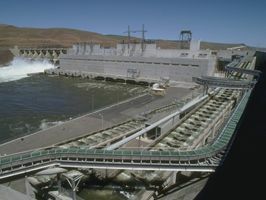 In addition to lowering spill to 40 percent for six hours in the first iteration from June 3 through June 5, the dam passed inflow for the next six hours (10 am to 4 pm). During these operations, the Little Goose pool was expected to rise above the one foot MOP limitation, and so the final segment of the day (4 pm to 4 am) increased the project's discharge to return to MOP. The operation also called on dam operators to maintain constant turbine operation during the lower spill times, to the extent possible. The second operation approved Monday by TMT for two days, June 6 and 7, called for 30 percent spill for six hours and that significantly raised passage of spring chinook at the dam. The operation also included a limitation of spill to 40 percent on the 4 pm to 4 am increased discharge period. That is to avoid exceeding 130 percent total dissolved gas levels in the Little Goose tailrace. The operation also recognized that "if inflows are higher than forecasted, or if there are unforeseen unit outages, the LGS pool may not be drafted back to the MOP range during this time period." The third operation, similar to the second, but with two extra hours at the limited spill level, began Wednesday and will continue through Wednesday, June14.